The last weeks of October were exceptionally busy for the world of 3D printing. After a big opening of the Shapeways Factory of the Future in NYC, the time came for the rainy city of London to host the first show where the biggest names of the 3D print scene came together to present their latest achievements. Set in The Brewery, a beautiful venue in central London, 3D Printshow attracted crowds of potential investors, artists, students or just curious minds who indeed feel that “the world is about to change”, as the motto of the event proudly declares. Certainly, even though at some points the organisation of the show was not as professional as one could expect (ignoring emails before the show, last-minute changes to the workshop timetable or the way some of the objects were exhibited), the show left me deeply impressed with the things that are already done using 3D printing and literally endless possibilities that this technology gives to creators and manufacturers. While it feels that the industry is still in its early years, the breakthrough is about to come soon and the storming phase in the market is happening just in front of our eyes. At the 3D Printshow I really appreciated the fact that you could directly and informally talk to all these passionate people who very soon might become the future Steve Jobs. Here are just some of the examples how they are trying to find their niche in this unbelievingly rapidly developing sector. 1. What’s new in printers? The show was definitely a good opportunity to show new models of printers to the public. And so, not only had we the new Replicator 2 by an old player Makerbot or the beautiful and simple in use Cube by 3D systems, but also quite a lot of start-up companies that literally have just gone out of their garages and workshops to show their first prototypes at very competitive prices. Replicator 2 by Makerbot in action. Old players like Makerbot and Ultimaker could afford printing bracelets that then were given to the visitors for free. One of the most interesting initiatives is CB-printer.com founded by Bartosz Cieluch in Poland. Rigid aluminium construction allows for stable high-speed printing. The printing sets come in two versions: CB-printer kit and assembled CB-printer with competitive prices of £1,168 and £1,228 accordingly. 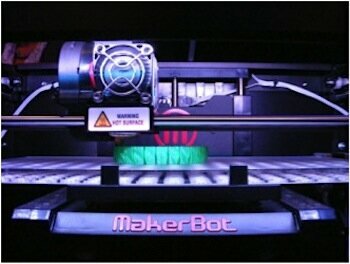 CB-printer – a new initiative in the 3D printing world directly from Poland. The other typical Do-It-Yourself printer at unbelievably low price of £729 comes from Sumpod, a family owned company based in the UK. It is definitely worth following. Sumpod – a new printer at a competitive price of £729. 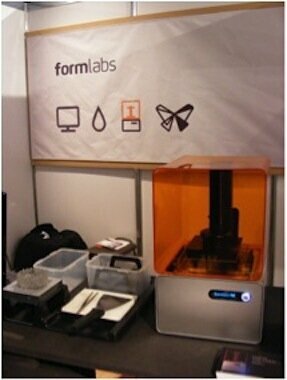 The title of non-questionable stars of the show goes to the guys from FormLabs from MIT with it much anticipated Form 1. The level of detail of this printer using stereolithography makes it the most accurate personal printer in the market. This, of course, does not go without any imperfections. The support structures from photopolymer resin which are necessary for this technology of printing are non-recyclable which in the end causes a significant waste of material. Overall, a very good try but the guys from MIT still have lots to work on. Another novelty that attracted much attention was Mcor Matric 300 printer which is supposed to make 3D printing experience as easy as printing on paper. This could be possible because the printer actually uses paper as material to print. Maybe in the future this genius idea will help us to get rid of tones of the paper waste to create high quality and low cost 3D models. Interesting! 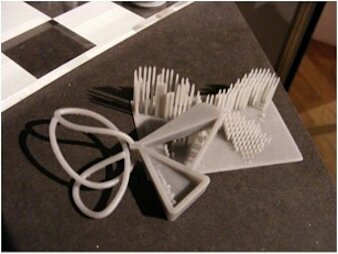 Mcor technology for 3D printing in paper is a fresh idea on the market. 2. What’s new in software? After this show is became clear that almost every company producing 3D printers is at least trying to create its very unique design software that would be compatible with their printer. Wishing them good luck, I will not go into details of these programs simply because they are too many and in vast majority they allow an average user to create simple forms but one can easily get stuck with more complicated structures and to achieve desired precision, you need to export them to CAD environment anyway. More interesting for me are trends in the companies that are specialising in software for design industry. Rhinoceros presented its new Rhino v5 with a revolutionary Symvol plugin by Uformia allowing for watertight volumetric modelling inside Rhino. Symvol is the first commercial geometric software for true volume modelling. It offers advanced modelling features, but at same time created forms are dynamic, easy to modify, and what is even more important, ready to print at every stage of the design process. Of course, Autodesk was not left behind and presented its new user-friendly application 123D Catch. With this free software you can import a series of photos of a physical object to your laptop or iPad and create a relatively precise 3D model. One of the greatest advantages of the software is time – it takes only 10 minutes to create a model that is ready to print. 3DTry.it is a promising application for smartphones and tablets which allows for quick visualisation of a virtual object in relation to reality. The software uses Linknode’s advanced Augmented Reality (AR) and GIality technologies to preview if a lamp, cup or fancy geometric shape that you have just designed will fit on your desk. Still, the program has a long way to go if it wants to become a reliable visualisation device rather than a gadget, with the scale referencing and modification as the first one to improve. With Willit? 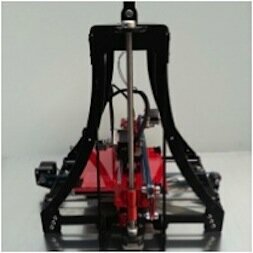 3Dprint website by Econolyst Ltd you can for free check if your design is watertight and suitable for printing. The system supports 6 main printers in the market and a range of materials. Useful gadget! 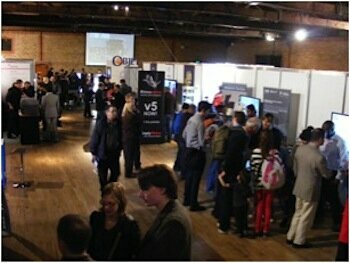 3D Printshow was indeed an intense experience for every 3D print enthusiast. Good news is that this is not the end. The show will be back to London in 2013, but it will be also showed in Paris and New York successively. 3D Print world – stay tuned! Aleksandra Kozawska is a student of Italian and Design at University College London, currently on her year abroad at Politecnico di Milano, Italy. Aleksandra is a 3D print enthusiast, but she also cannot wait to pursue her career in this field after her studies.